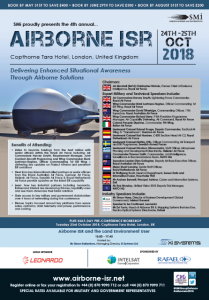 SMi Report: Leonardo, Intelsat General, & Rafael join this year’s 4th annual Airborne ISR conference as sponsors, taking place this October in London. LONDON , LONDON, UNITED KINGDOM, July 6, 2018 /EINPresswire.com/ -- SMi Group has recently announced Leonardo as the Gold Sponsor, and Intelsat General and Rafael as the newest sponsors of the 4th annual Airborne ISR conference, returning this autumn to London, UK on the 24th and 25th October 2018. The two-day event is set to feature leading ISR platform programme managers, technical experts involved in BLOS data links, officers delivering new optronics and sensor suites as well as providing insight into the latest power and engine performance. In addition to two full days of presentations and panel discussions from expert speakers, the event will also feature a half-day pre-conference workshop on 23rd October 2018. Gold Sponsor Leonardo’s Airborne and Space Systems provide the sensors and electronic systems that sit under the skin of the world’s most advanced aircraft, effectively acting as their brains, senses and nervous systems. Protecting pilots, alerting air crews to threats and providing crucial intelligence back to observers on the ground, the technology we offer can make the difference between life and death for our customers. In the UK, Leonardo are proud to provide the latest technology to the UK Armed Forces, as well as exporting it around the world. Leonardo will be speaking and exhibiting their products at the conference over the two-days. Intelsat General is a trusted partner to the U.S. and NATO governments. Their newest generation of high-throughput satellites, Intelsat EpicNG, enables links to/from these airframes that are two to three times more efficient than on traditional wide beam satellites using antennas as small as six inches (UAVs). This year’s insightful event will include 14 additional thought-provoking speakers, with over 5 hours of networking, bringing together a global audience of senior ISR decision makers from the military, research, and industry sectors. In addition, attendees will receive the guidance of technical leaders from research and industry, whose insight into the latest platforms, systems and sub-systems will deliver greater awareness of existing and future capability for the modern operator.